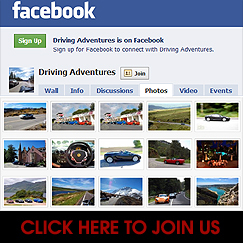 Driving Adventures Limited is a world leading specialist tour company providing enthusiasts with the opportunity to enjoy our international and national ”driving adventures” across some of the best roads located amongst some of the world's most scenic destinations. A simple one – to provide a “one stop shop” for unique global driving holidays for car clubs, dealerships, motoring magazines, individuals, groups of friends and basically anyone who has a desire to explore and enjoy the open road. Our approach is to advance, develop and enhance the level of driving tours utilising the latest technology, combined with a relentless focus on research, quality of service and attention to detail. We would like to thank all of our customers for their loyalty and support and we hope we continue to be a part of your vacation adventure plans for many years to come. Darren Taylor, a Chartered Certified accountant spent eighteen years in the world of finance before he formed Driving Adventures in 2005. The aim was to bring together like-minded enthusiasts who wanted to explore the world’s most exiting roads and scenic locations while at the wheel of a sports car. 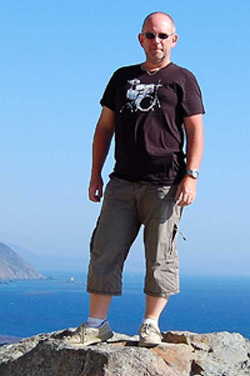 Darren is responsible for unique tour route research and designs, mapping software programming, hotel sourcing, liaising with third party car hire companies and contractual matters in relation to ferry operators, while dealing with the company’s advertising and marketing requirements. Darren deals with all sales enquiries, from individuals to corporate organisations, while he also researches and maintains all aspects of our advanced in-car technology including the GPS systems and programming and our 2 way radios. Naturally Darren also undertakes the daily requirements of the company’s financial matters and associated administration. Darren is married with three children. Darren is also a co-director of Nick Whale Sports Cars. Graham started out as musician in the 1980s, but also travelled the world on the road crews of rock groups such as Phil Collins, Genesis and Supertramp before moving into the travel industry in 1988. Specialising in groups, he has handled the complex travel arrangements for bands such as Oasis, The Moody Blues and Alanis Morrissette before he formed Tour Travel International in 1999 which quickly grew to become a world leading travel agency with clients such as Peter Gabriel, George Michael, Geri Halliwell and Lisa Stansfield. Along the way, he has also managed rock groups and staged large public car events such as the very successful TVR C.R.E.A.M day in 2005. 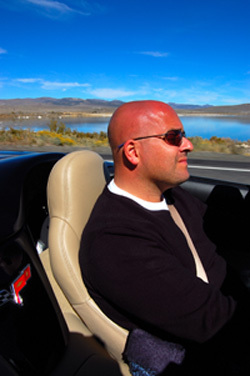 Graham teamed up with Darren and Driving Adventures in late 2005 and is responsible for hotel research, reservation contractual matters along with flight detailing and management. In addition, he designed and maintains our company website and our own bespoke travel reservation system. As well as filming and producing our online movies and dvd presentations, Graham is responsible for our on tour photography, galleries and advertising artwork and a number of his images have been published by the likes of Autosport and on Daily Sports Car.com. Graham returned to his first passion of the drums in 2009 and has since toured the UK with a Pink Floyd Tribute show, performed on numerous sessions and played with a professional corporate events and weddings band. These days he is also the logistical and tour manager to Simon Collins and his band Sound Of Contact. Simon is the multi talented son of the lgendary Phil Collins whom Graham worked with in the 1980s. Graham is married with one daughter, while his own passion for sports cars, has seen him owning a number of TVRs and Corvettes.